London, The Pindar Press, 1987. FIRST EDITION (Limited Edition). 8vo, pp. 143. 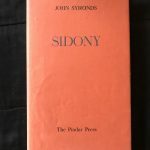 Verso of last leaf states: “100 copies of Sidony have been printed in a Limited Edition for The Pindar Press of which 80 numbered copies signed by the author are for sale. This copy is number ……”. Bound in scarlet cloth, with gilt lettering stamped to spine. 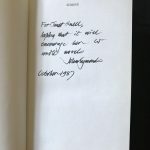 Half-title with author’s dedication to a friend: “ For Janet Snell, / hoping that it will / encourage her to / write novels / John Symonds /October 1987. Also, several pen additions by the author to the errata slip bound after the title-page. A very good copy.